This one-of-a kind guide is devoted to southern Nevada's recreational wonderland. It details numerous hikes in and around Las Vegas. 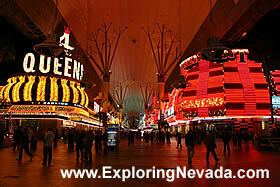 Fremont Street in Las Vegas is the way most of Las Vegas used to be. Neon lights, accessible “gentlemen’s clubs”, inexpensive rooms, cheap (if not necessarily good) food, cheap touristy trinkets, and the list goes on. And all that, and more, is why I rather like visiting Fremont Street. You see, as the rest of Las Vegas has gone through a boom (and now, for the time being, a bust), and caters to the higher end visitors, Fremont Street still caters to the visitors who visit Las Vegas on a budget. Additionally, Fremont Street in Las Vegas has one very unique attraction, the massive Fremont Street Light Show. Below are the varoius hotels and casino's that are specifically located on Fremont Street in Las Vegas. Other hotels in Las Vegas are listed either in the Las Vegas Strip Hotels or the Las Vegas Metro Area Hotels pages of this site.